Published in two volumes in a slipcase as a limited edition of 850 copies, each one signed and numbered by the author. Each volume comprises 156 pages (297 x 323mm) with over 400 photographs taken in period, many never previously published, compiled over the past decade, as well as drawing on the author's unrivalled personal collection. There are also reproductions of period catalogues, original technical drawings and charts, contemporary advertisements and ephemera. The books tell two differing, but totally related, stories. 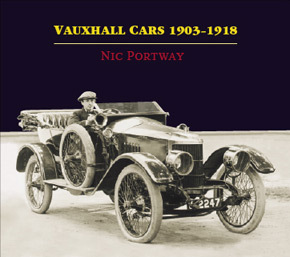 The first is of Vauxhall cars, built for sale, from the beginning of the 5hp tiller-steered, single-cylinder models to the D type 25hp staff cars which were such a success in the field throughout the Great War. The second is the story of the company's competition exploits; hill climbing, racing at Brooklands and abroad as well as record-breaking at an international level. Recording the beginnings of the Vauxhall Light Car and the building up of a steady production followed by the move to Luton. Starting in 1908 with the explosive arrival of the Vauxhall as a competition winning marque in the International Touring Car Trial.